Each song in the trio's generous set was meticulously arranged to make the most of the many ways the musicians could blend. Serene understatement was the concert's hallmark; at times, the music was so quiet I could hear the club's floorboards creaking. Why See I'm With Her? 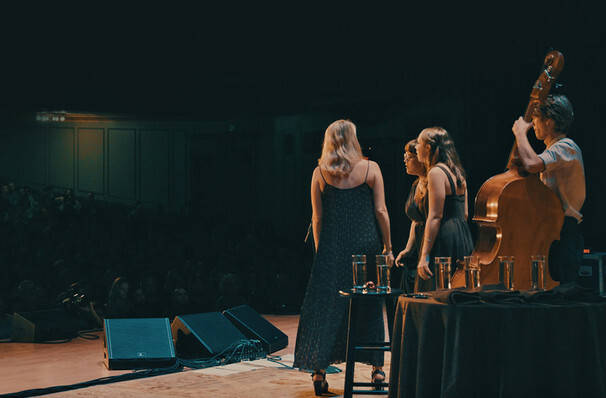 Separately these three performers are respected solo virtuoso that have left their mark on the Americana landscape, but Sara Watkins, Sarah Jarosz and Aoife O'Donovan were brought together by chance when their lilting harmonies soared during an impromptu gig in 2014. That small spark lit the fires of I'm With Her, the trio's brand new project. 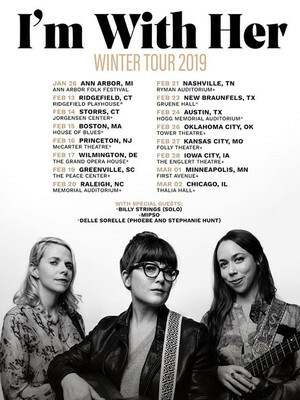 Catch them on their 2019 Winter tour! Existing at the intersection between folk, bluegrass, jazz, world and chamber music, I'm With Her's music plays to its members strengths - Watkins' fleet fiddle fingerwork winds around Jarosz's hypnotic mandolin picking and O'Donovan's steady, guitar strumming, all while their three-part harmonies sweetly interlace. Plaintive, bluesy and warm, their songs speak to the heart's deepest yearnings. Sound good to you? Share this page on social media and let your friends know about I'm With Her at The Space at Westbury. Please note: The term The Space at Westbury and/or I'm With Her as well as all associated graphics, logos, and/or other trademarks, tradenames or copyrights are the property of the The Space at Westbury and/or I'm With Her and are used herein for factual descriptive purposes only. We are in no way associated with or authorized by the The Space at Westbury and/or I'm With Her and neither that entity nor any of its affiliates have licensed or endorsed us to sell tickets, goods and or services in conjunction with their events.